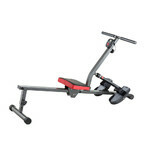 Hydraulic piston rower, comfortable padded seat, easy-to-use single-button control panel, vertical reclining for easy storing. 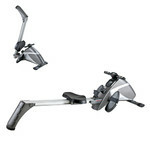 The Rowing Machine inSPORTline Power Master X is an effective accessory suitable for full body workout. Instead of a regular flywheel, it features a hydraulic piston which allows you to choose from 16 resistance modes (all you have to do is turn the regulation knob). 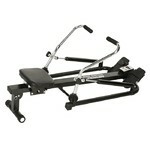 This rowing machine features a 90cm-long, aluminum rail and a comfortable seat covered with synthetic leather. Due to pivoting grips, you can row in various modes. Moreover, the handles are covered with soft foam, thus allowing for a better grip. 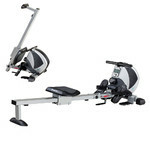 Moreover, the Rowing Machine inSPORTline Power Master X features an easy-to-use, single-button control panel. On the easy-to-read display you can follow all the important information such as time, distance, current and total number of strokes and calories burned. The rowing machine workout helps strengthen the entire body, effectively reduce body fat and maintain the proper function of the cardiovascular system. 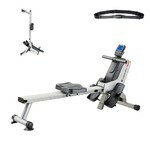 All of the above makes the Rowing Machine inSPORTline Power Master X perfect for home workout. Regular training improves your physical fitness, helps you lose weight and strengthens your cardiovascular system. Resistance in cardio trainers can be regulated by one of two ways - manual and electronic control. Manual regulation is the cheaper option and works on a simple basis. With a regulation knob, the user sets the resistance manually, usually in the range of 1-12 levels. 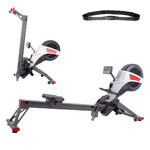 Cardio trainers use several types of braking systems. There are trainers with magnetic, friction, calliper or EMS braking system. The magnetic and EMS systems that work through moving a magnet closer to the flywheel are used most often. HRC program (Heart Rate Control) is a function that automatically adjusts resistance to keep your heart rate in optimal frequency. This makes exercising more effective, especially if your aim is to burn fats. Why Exercise With a Rowing Machine? 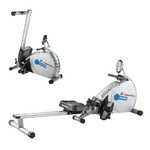 What Braking System to Choose for Your Rowing Machine? 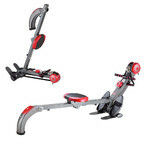 How to Choose a Rowing Machine?